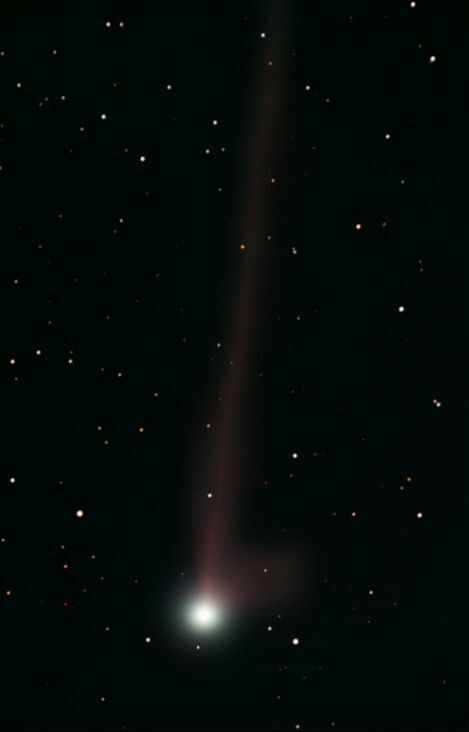 This comet was discovered on January 2, 2006, by Crzegorz Pojmanski from a photo of the southern sky taken in Chile. Fortunately for us, the comet moved far enough north so that it became visible from the Northern Hemisphere just as it began to brighten considerably. The comet reached an estimated brightness of magnitude 5.5 by March 1. As you can see from this image, the comet grew a nice long tail. This image does not do the tail justice, because I was only able to capture a portion of the tail of the comet in this image. I was using a focal ratio of f7. This image was taken on the morning of March 5, 2006. The comet was low in the eastern sky just before dawn. I only had a 30 minute window of time to take this image between the time that the comet rose above the mountains to the east of my location, and the time that the comet was lost in the morning twilight. Click on the above image to see a larger image of the comet. This is a composite CCD image taken with an ST-8XE and CFW-8 color filter wheel using a Takahashi FCT-150 refractor telescope. This image was taken from my backyard in Scottsdale, Arizona. RA: 20h 35m 32s Dec: +03d 05' 50".